On the 20th of this month I am going to give a talk at Sheffield university on my PhD thesis. I will be spending the day up there to talk to Prof Robert von Fay-Siebenburgen about the application of 2D surface wave in MHD. I will post the talk here when I complete the talk. It will be interesting as I am interested in getting into MHD and this seems an ideal opportunity to get into the area with an expert in the field. I am now in the throws of finishing my first post-PhD paper!! It will be co-authored with Denys Dutykh who helped me to fully understand the method used to derive the question in the first place. The next stage would be to have small amplitude waves in finite depth and then onto the weakly nonlinear stuff, which then would be another paper in itself. I also found a paper with the leaky dielectric model in who also worked on this stuff and derived their own weakly nonlinear equation and I lifted their evolution equation for the charge and managed to extend my results by a little. My work on my PhD has all been with inviscid fluids, that is to say that is no shearing, the fluid is free to flow. I have been working on a simple extension to the infinite depth case and I found some interesting results. The method I have been using has been using the visco-potential approach, that is I have been extending the potential approach by decomposing the velocity vector into a gradient and curl part and assuming that the viscosity is small. The initial results look very good, as expected the viscosity adds a single term to my original equation, it is a complex term and this allows for waves. There has been work to model free surface flows using a Reynolds approximation approach, the analysis was completed with a forcing – topography, so any extension to this analysis would include going up to 3D or adding a surface current, this would involved adding a charge evolution equation. I am proud to say that I have finally completed my PhD! I have completed my minor corrections and have had them accepted, now all I have to do is hand in the final copy. Here is a copy of my PhD thesis for your interest, constructive comments always welcome. I am currently coming to the end of my PhD and the horrible world of work is looming. So I was looking at the job site for academic positions and I came across a position at Reading university, the Richard Rado fellowships, one in maths and the other in statistics. This postdoc is actually quite a good on, I had to submit a research proposal. , which is an extension to the work I have been working on for my PhD. It is a natural extension to my current topic, where I consider the more physical case of having charge on the actual interface of the fluid and the field. It needs the fluid to be viscous, so I can’t use my current methods but they can be extended slightly, so I can go completely in a different direction. It will be interesting to see if the two models agree or not. That’s IF I get the postdoc of course. A big conference coming up. I am due to give a talk at a conference to celebrate the retirement of Professor Roger Grimshaw, it’s quite a big international conference with some very big names giving talks and therefore it should be very worthwhile attending. I will be giving a talk on my latest work which is a generalisation of my previous work from two dimensions to three. 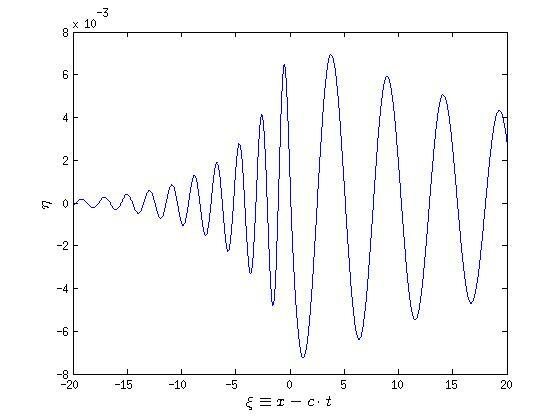 I believe I have given the first physical derivation of the 5th order KP equation with an external electric field with a moving pressure distribution. 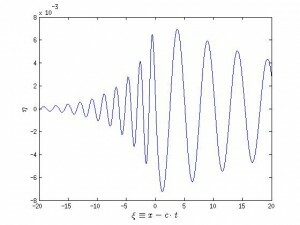 I think that it can also be used to extent the Benjamin-Ono equation as well as it includes a Hilbert transform term. My talk. The 2012 BAMC was a great deal of fun, lots of good and informative lectures going on and typically everyone else’s work is far more interesting than yours. Met a colleague of my supervisors and saw the work that they’re doing, it’s very similar to mine with a small tweaking of the Bernoulli equation for the ice sheet as an elastic thin sheet. Gave my talk and I didn’t go over time which was good, I should have some more interesting stuff to present next year in Leeds. I am in the process of coding up my equations for electrohyrodynamic flow adhering to an upper surface. I have got the code sort of running, I should be able to compute the pictures relatively soon. I will post a few for your interest. I have a section of my website devoted to my tutoring, I hope to get a few students that will hope fully get me a bit more experience in teaching. I got the best score from the student feedback which is good to know. I will offer extra learning materials that will hopefully help them in their studies. Remember I am in Bristol in the St Georges area. Jean-Marc and I are writing our first paper together, hopefully we can get it published in a well respected journal, physics of fluids or journal of fluid mechanics or something like that. When the paper has been accepted for publication, I will post a copy here.